Dean started their agency in October 1987 with general litigation investigations. Dean and Karen together have approximately 50 years of combined investigative experience and a combined official death investigation experience of over nine years at a busy and unique coroner/medical examiner’s office; and since 2008 in private subject matter expertise. 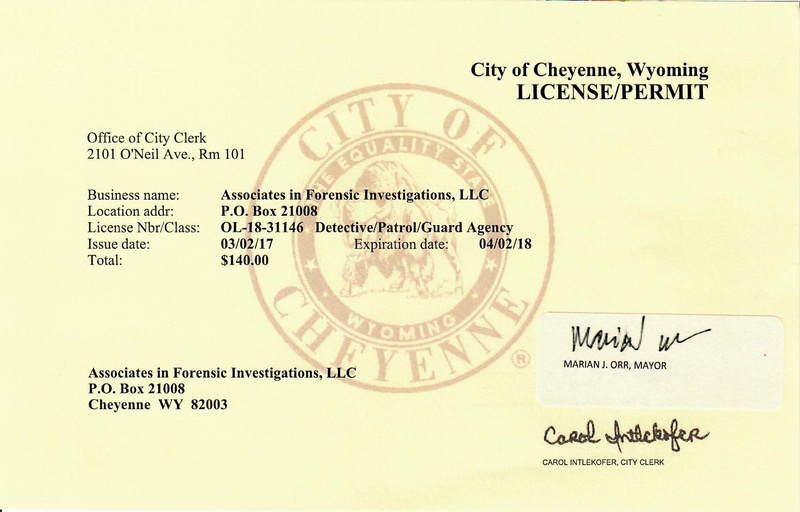 They were also among the first to be licensed private investigators under Colorado's unique (2012) and unique 'Voluntary Private Investigator Licensure Program'. The voluntary licensing program was repealed in May 2014 and in June 2015 the new mandatory licensing law was effective. See www.ColoradoLicensedPrivateInvestigators.com for details. 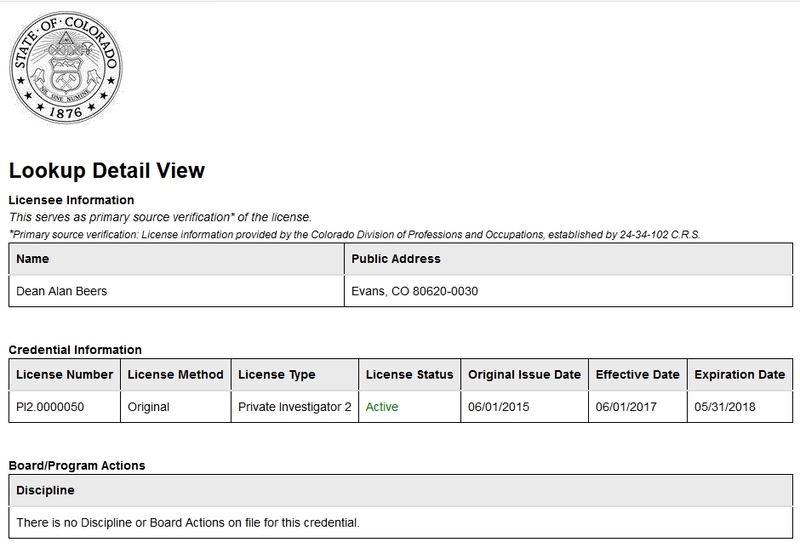 AFI-LLC continues to seek the distinction to our professionalism by being vetted for our experience, character and references that licensure assures our clients and consumers. Licensed private investigators hold themselves to a higher level of professionalism and accountability for their peers, clients and the general public. 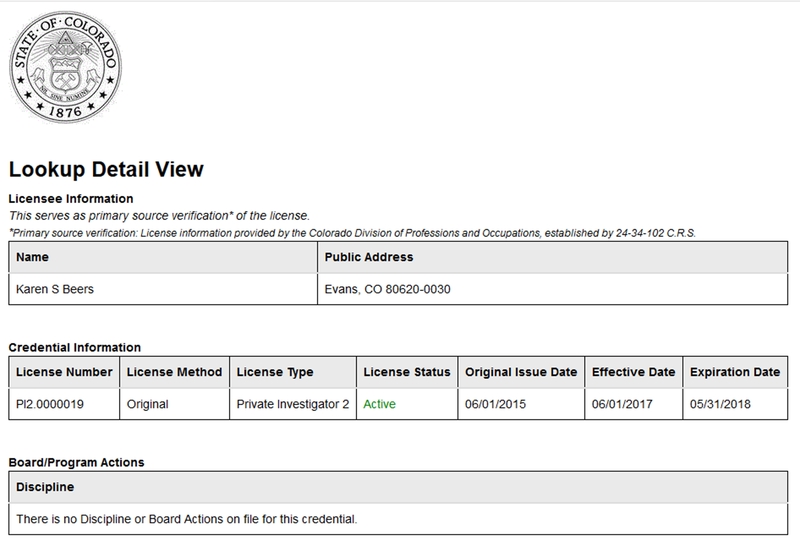 Dean is one of less than 80 Board Certified Legal Investigators (CLI) internationally and the only in northern Colorado. With his wife, Karen, he is also a Certified Criminal Defense Investigator (CCDI) and Certified Forensic Interviewer-Forensic Testimonial Evidence Recovery (CFI-FTER); they are one of three husband & wife CCDIs and CFI-FTER teams nationwide. Dean and Karen are also certified Medicolegal Death Investigators. He has extensive background in medicolegal-forensic and factual Investigations with law enforcement education, experience and relationships. He has testified as an Expert in Forensic Investigations of Pattern Injury Analysis and Private Investigations, and is currently consulting nationwide as an expert in criminal defense homicide and civil equivocal death investigations for law firms, investigative colleagues and families. As a death investigator Dean was involved in the investigations of all manners of deaths and incidents, training under six Forensic Pathologists. From 2003-2008 he investigated over 150 scenes, assisted with approximately 400 autopsies and investigated nearly 600 additional non-autopsied cases. This does not include over 1,100 additional cases not taken for jurisdiction, in training or as the backup investigator (frequently in homicides and child deaths). Over 6,500 hours of experience specific to death investigation and related injuries, negligence and causation - from investigation to forensic autopsy assistance. Education and Training from 2000-2008 includes over 600 hours in the Law Enforcement Academy and 1200 hours of general and forensic investigative specific training in multiple disciplines. Dean has written and presented extensively on multiple investigative topics, and has authored three books - 'Practical Methods for Legal Investigations' and 'Professional Investigations: Individual Locates, Backgrounds and Assets & Liabilities' and 'A Survivors' Guide to Death Investigations' (the latter two with Karen). Also with Karen he co-developed 'Death Investigation for Private Investigators', an online continuing education course at www.MedicolegalDeathInvestigations.com. Dean has won two Editor / Publisher Awards from the National Association of Legal Investigators official journal 'The Legal Investigator' for 'Reviewing and Comprehending Autopsy Reports' (CLI white paper, 2nd Place, 2011) and 'Interpreting Bruises and Related Soft Tissue Injuries' (1st Place, 2014). He is also a member of the National Defender Investigator Association, National Association of Medical Examiners, Inner Circle of Investigators, and International Association for Identification. and the California Association of Licensed Investigators.